This whole chicken makes an impressive centrepiece to any meal. 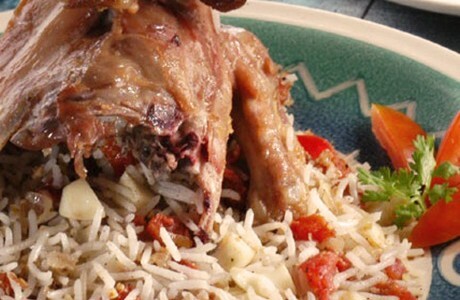 The simple marinade of salt and bicarbonate of soda is a common technique in Eastern cuisine for tenderising meat, giving this chicken a delicious, delicate texture, filled with a rich, tasty stuffing. Wash the chicken and dry with kitchen paper towels, making sure that the cavity is dry as well. Keep aside. For the marinade, rub the salt and bicarbonate of soda into the chicken; marinate for 1 hour. Heat 2 tbsp unsalted butter in a large, frying pan; add the chicken and fry till golden brown. Remove and keep aside to cool. For the stuffing: Mix all the ingredients mentioned and spoon this mixture into the cavity of the chicken. Place the stuffed chicken in an ovenproof dish. Dot the chicken with small portions of the unsalted butter and roast in a preheated oven (180°C / 350°F) basting regularly with butter, until the chicken becomes tender. Remove the chicken from the oven and carve into serving pieces. Serve with a small amount of the stuffing, scooped out of the cavity.